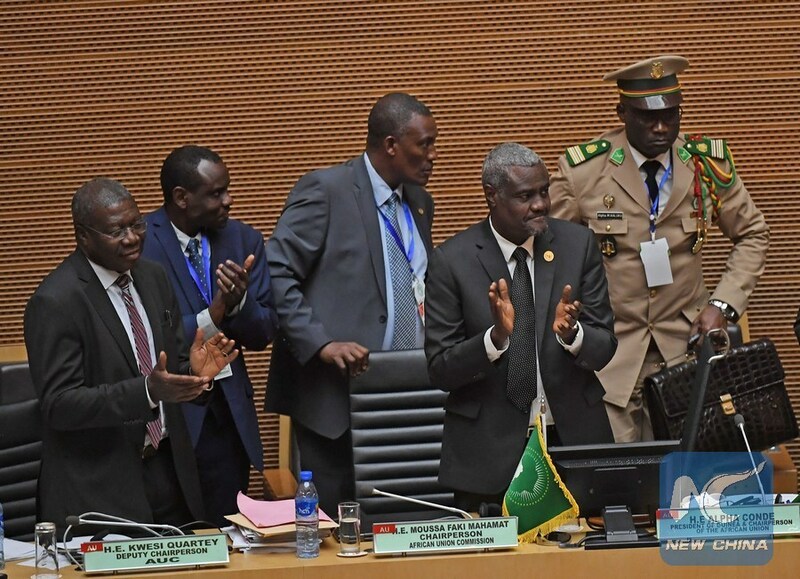 ADDIS ABABA, July 5 (Xinhua) -- African leaders attending the 29th AU summit in Ethiopia's capital Addis Ababa have taken steps further toward owning a financially independent African Union (AU). 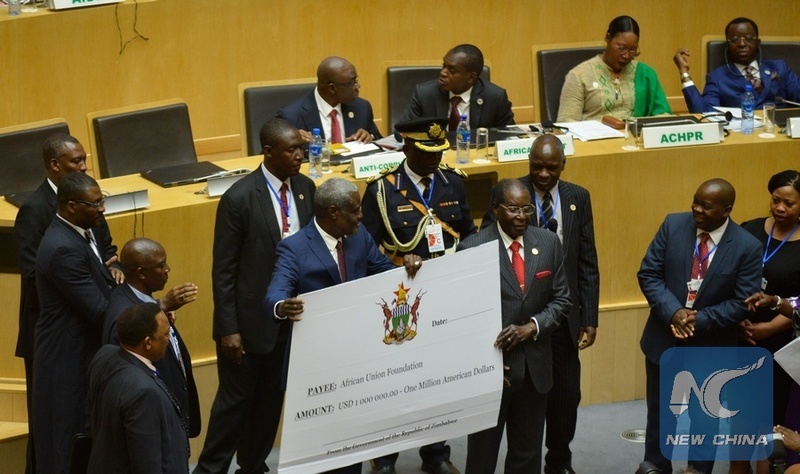 The latest call was made by Zimbabwean President Robert Mugabe, who urged other African leaders to take the momentum forward to make AU financially independent. Mugabe, who previously pledged 300 cattle in supporting the newly established AU's foundation, affirmed in his remarks at the opening of the 29th AU summit on Monday that "finding alternative ways of funding the Union is the most urgent task." Calling on heads of AU member states to take measures to finance AU, Mugabe stressed that "unless and until we can find our role, the African Union will not be truly our own." The AU has frequently expressed its concerns that the financial shortfall has created a significant gap between its planned budget and actual funding, which hinders the effective delivery of its agenda. According to figures by the pan-African block, only 67 percent of the AU's assessment for money contributions by member states are actually collected annually, and about 30 member states default either partially or completely on average annually. At the 27th AU Summit held in Rwanda last year, a financing proposal was adopted to direct all AU member states to implement a 0.2-percent levy on eligible imports to finance the AU. The initiative mainly aspires to create an equitable and predictable source of financing for AU and to reduce dependency on partner funds. The financing proposal, which targets to cover 100 percent of the Union's operational budget, 75 percent of its program budget and 25 percent of AU's peace fund. Countries such as Kenya, Rwanda, Chad, Ethiopia, Republic of the Congo and Ghana are said to be at the forefront in implementing the 0.2-percent levy on imports of eligible goods to the continent from a non-AU member state. According to Thomas Kwesi Quartey, AU Commission Deputy Chairperson, the financing proposal of the Union, as AU's major reform target, is designed to assist the block to effectively address challenges that continue to hamper AU from realizing its potential by avoiding the search for donor. "To reaffirm Africa's renaissance and in appreciation of the difficulties we face in the over-reliance on development partners for funds, whose biases and priorities sometimes negate the spirit of Pan-Africans, the momentum in the implementation of the 0.2 percent levy continues to gain traction," the deputy chairperson said. Quartey also expressed his hope that "all the 55 AU member states will manage the full, consistent and timely implementation of this decision by the year 2018." The United Nation, AU's major partner in various activities concerning the continent, has also expressed its continued support as African leaders commit themselves towards AU's self-reliance in its quest "towards a prosperous Africa." Speaking at the opening of the 29th AU summit on Monday, the UN Deputy Secretary-General Amina Mohammed affirmed that the UN "commends African leaders for their commitment to self-reliance as reflected in their decision to fund 25 percent of the AU's peace and support operations by 2020."